An inexpensive way to create lots of memories to enjoy on your Disney World vacation and for years afterward is an Autograph Book. Retailing for just $6.95, you can purchase the Official Disney World Autograph Book at http://www.disneystore.com/ or you can find it at most of the gift shops in the Walt Disney World Resort. 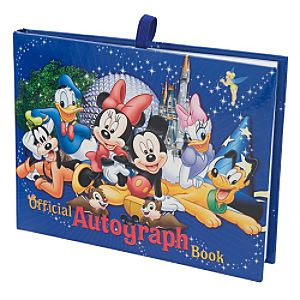 Note: You don’t have to have the “official” Disney autograph book to get Character’s autographs. Homemade autograph books work well and often make a good pre-trip activity to give the kids something to do before their trip. You can also buy plain autograph books or notebooks and use them. Where Can You Find The Characters? There are lots of opportunities to get character autographs while you are at the Walt Disney World Resort. In each of the parks there are locations where characters can frequently be found. Magic Kingdom: In Mickey’s Toontown Fair you can get Mickey Mouse himself to autograph your book in the Judge’s tent. Nearby is the very popular Pixie Hollow featuring Tinkerbell and her fairy friends. Epcot: Character Connection next to Innovations West is a great place to get autographs from several characters. There are also characters found in many of the countries in the World Showcase. Animal Kingdom: Camp Minnie Mickey is where you can get pictures of Mickey, Minnie and others. Avoid going there right after the Festival of The Lion King show lets out as the lines will be long. Hollywood Studios: You will find many stars of the Pixar Movies here. For the most recent movie characters go to the Magic of Disney Animation attraction. Currently the characters from the Pixar movie "Up" are there. Also characters appear near the giant Sorcerer Mickey Hat on a regular basis. The Magic Kingdom posts the character greeting areas on the Main Tip Board on Main Street. Use the show times guide that you get when you enter the parks to get additional information on planned character greeting times and locations. You will also come across random character spotting throughout the parks, so have your autograph book and cameras handy at all times. It is best to use a ball point pen for the characters to sign with. If you have a larger, thicker pen that works well for some of the gloved characters to be able to grasp it. Be patient in the lines and you will get your turn. Pay attention to the character’s handler for instructions and information about when the character will be going on break. They will let you know if it will be a short break or an extended one. These are great because you will not feel as rushed with the characters as they will come directly to your table to spend a little time with you and sign autographs and pose for pictures. Great autograph book tip: If you have the characters sign one side (left or right) of each set of two pages and leave the other blank, you can print the pictures you took of your child and the character and place it in their book next to the character’s autograph after you get home. This will really make the books special for the children. The Autograph book is a very inexpensive way to help your child create something that they can refer back to long after your Disney World vacation. This will definitely outlast any toys or trinkets you may purchase, and each one becomes unique with your child’s particular collection of autographs. No two books ever end up being exactly alike, creating magical Disney memories that they can treasure forever. 2 comments to "An Autograph Book Creates Magical Memories For Children At Disney World"
This is a great way for your young one to organize all the great characters they might meet at the park. Great post - you have some really good tips here. I'm a big fan of the personalised autograph book - I spent hours creating a page for each character with their picture and quotes from their movie etc. The characters loved it and I got lots of extra interaction. Here's a link to my pages in case you or your readers are interested: Disney Autograph Books.